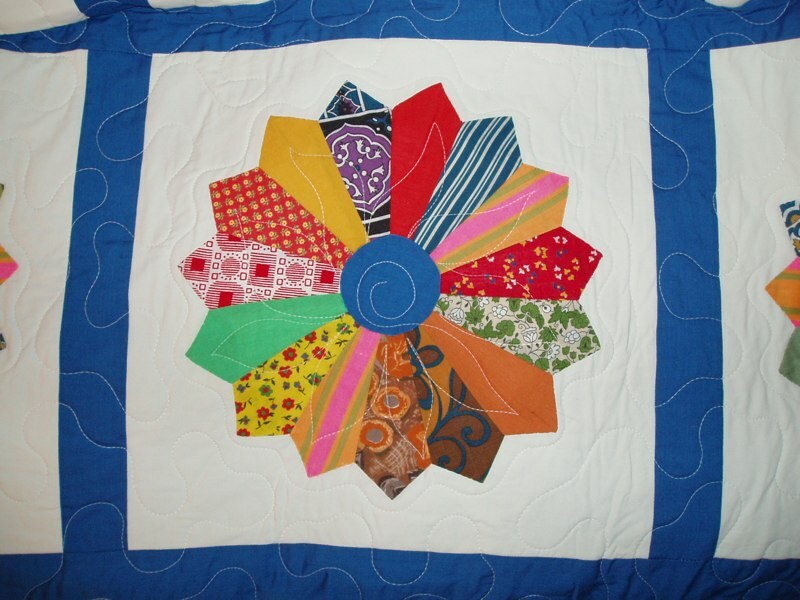 Solveig created this Dresden Plate Quilt top in the mid 1970’s (when she was still doing all her quilt work by hand, and we were living in Dartmouth Nova Scotia). 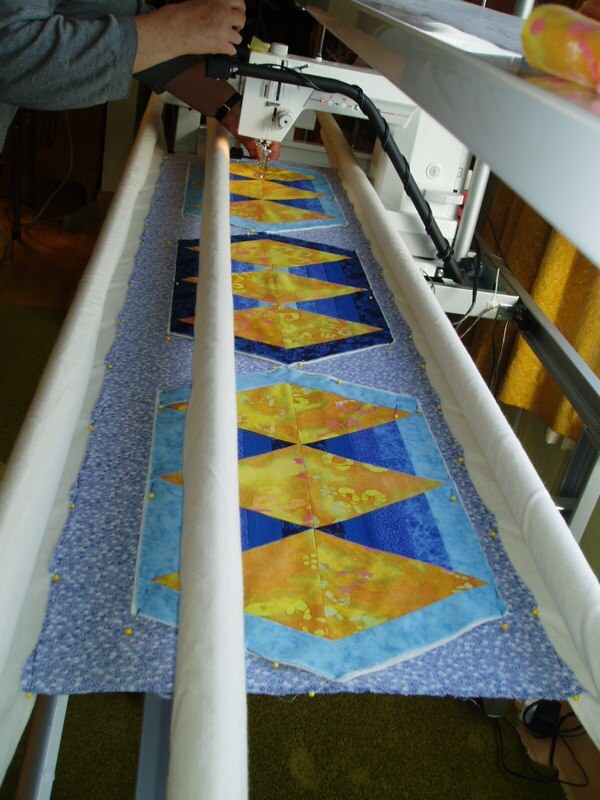 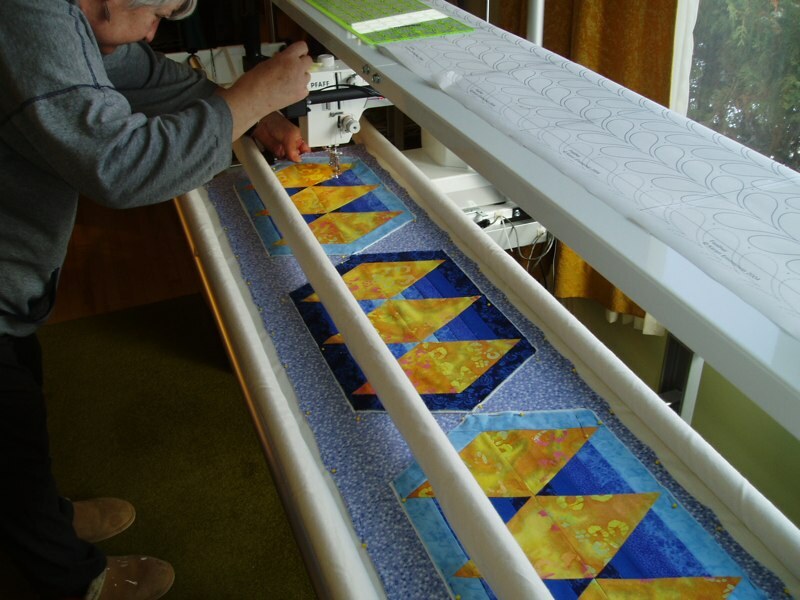 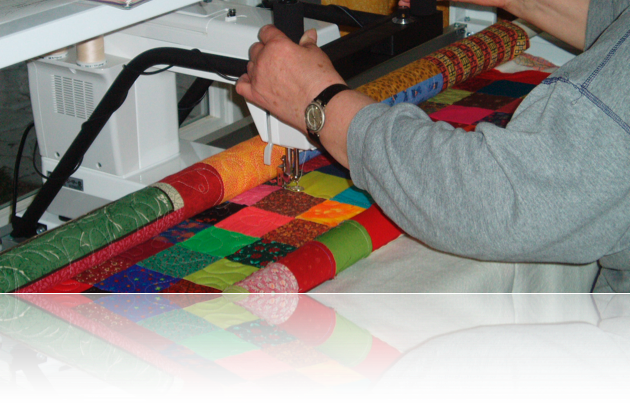 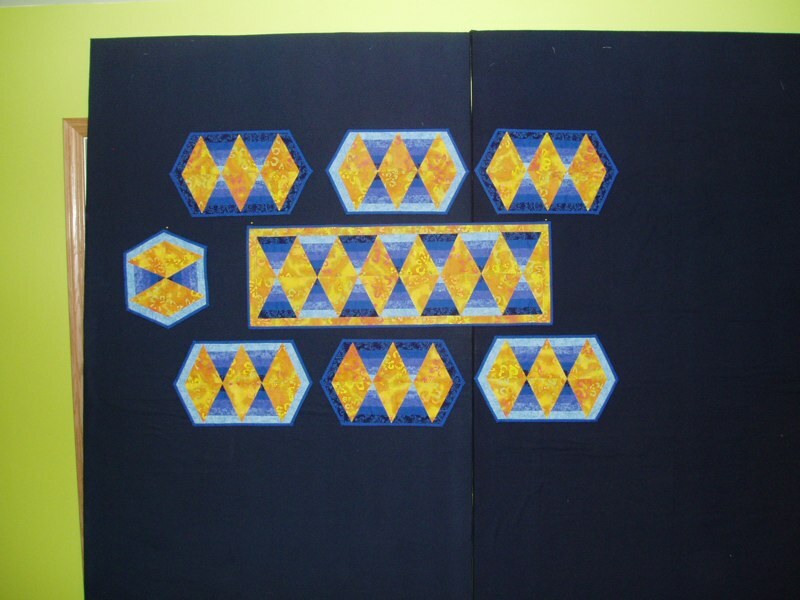 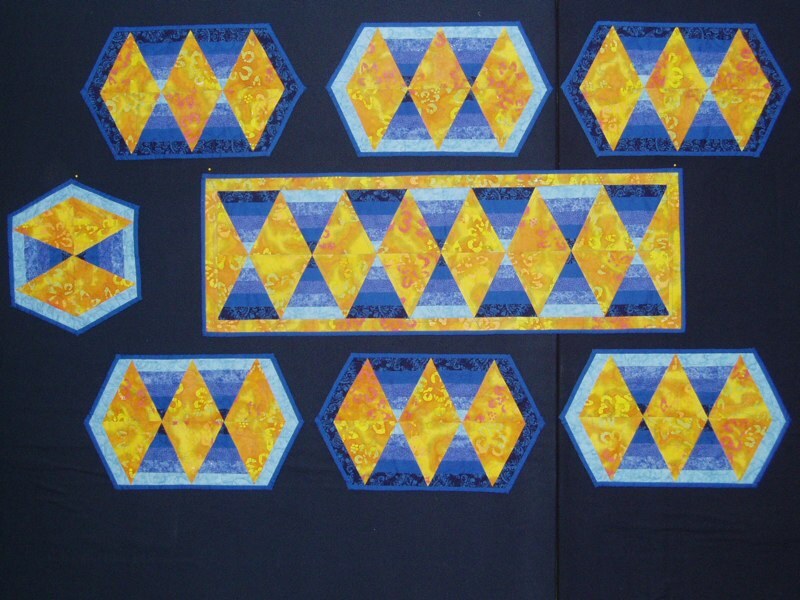 In 2002 Solveig asked her friend Blanche Nichols, in Slidell Louisiana to machine quilt this for her. 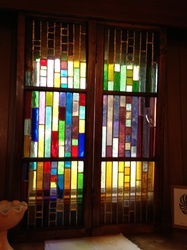 Blanche did a wonderful job, as usual. 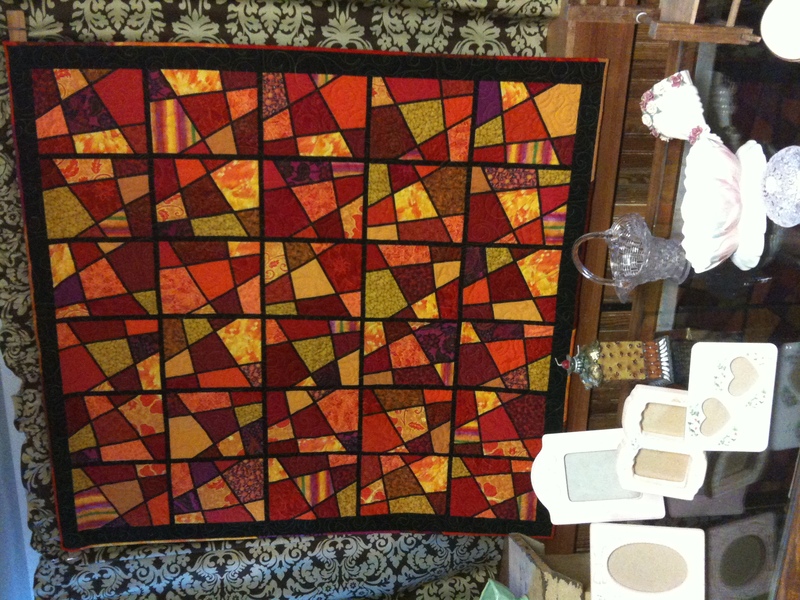 Unfortunately, Blanche lost her quilt shop to Katrina. 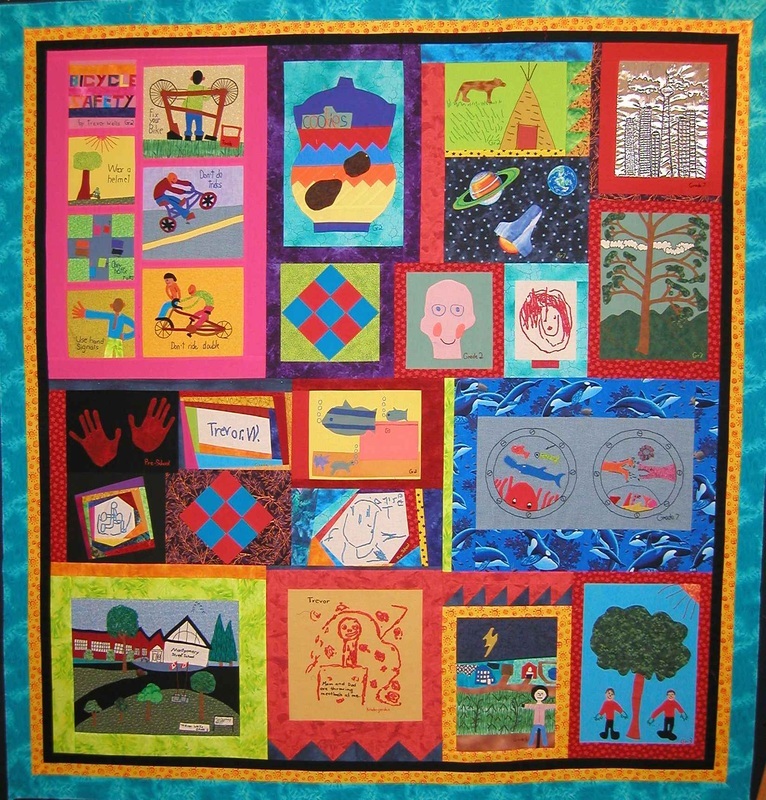 Solveig's new Inspira Quilt Frame arrived while she was in hospital getting a new artificial hip (in Fredericton), just 5 days before Hurricane Katrina (in Mississippi). 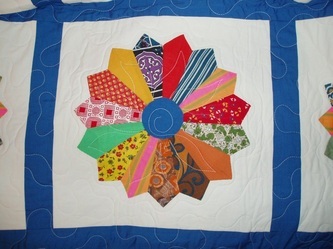 Creating these small quiltlets, as a set of place settings was one of her first projects on the Inspira. The Inspira is now our daughter Tara's, having been replaced in 2011 by a Handi-Quilter Avante. 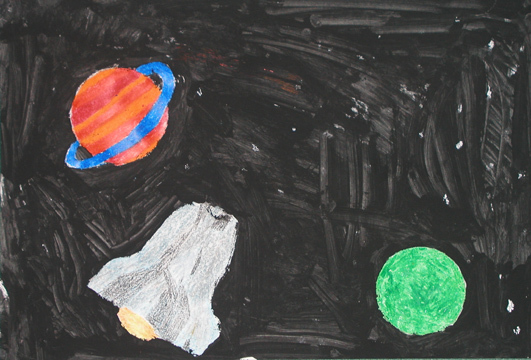 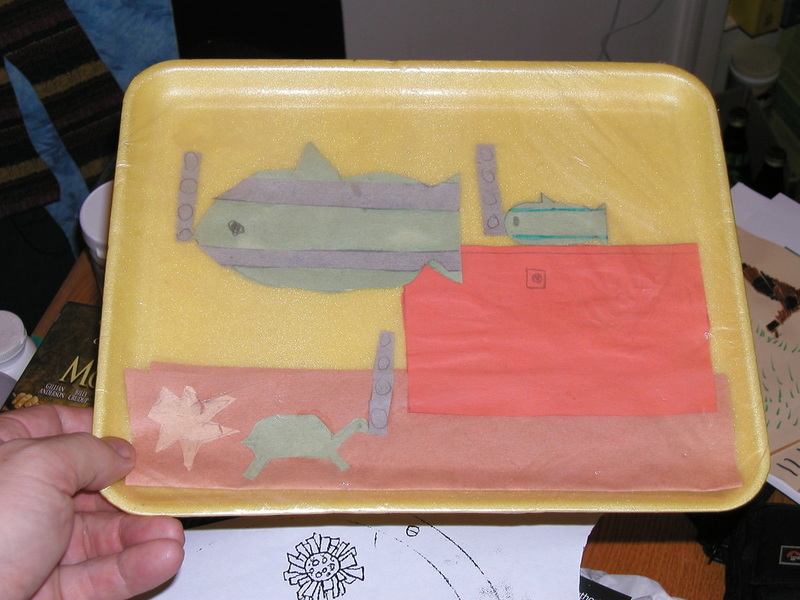 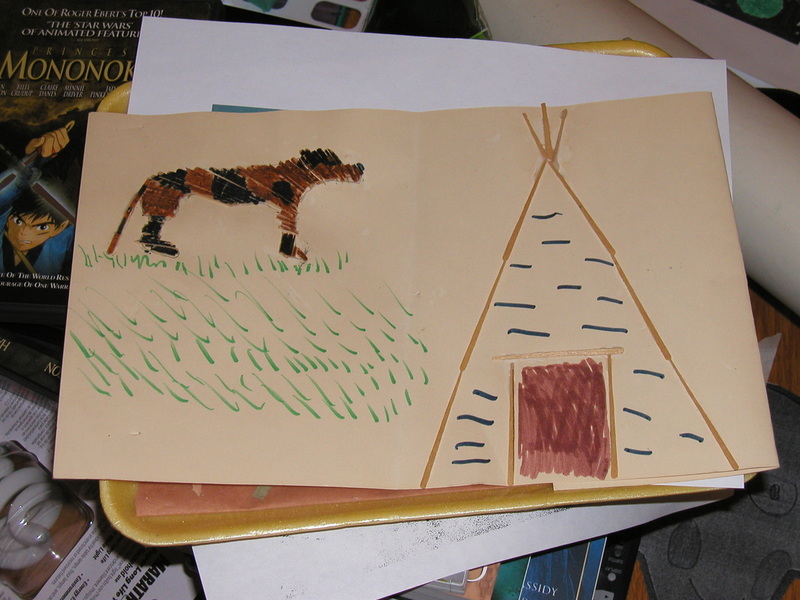 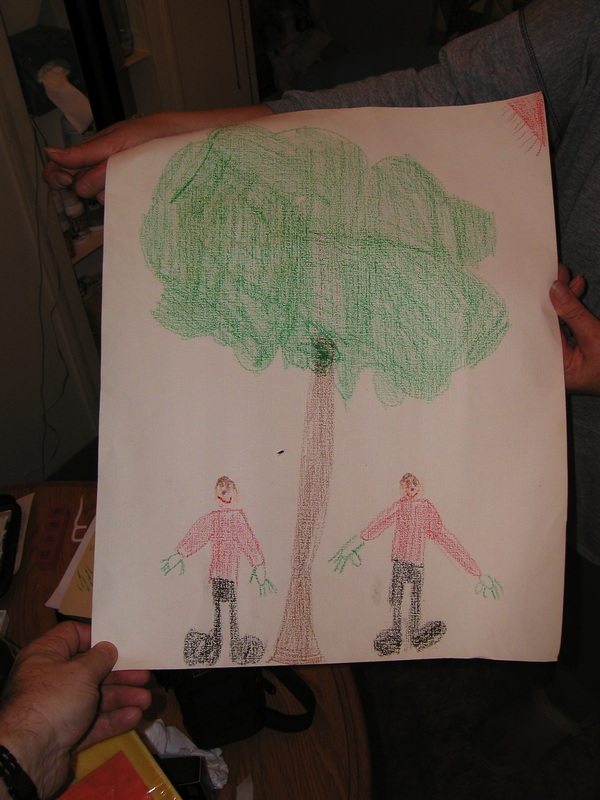 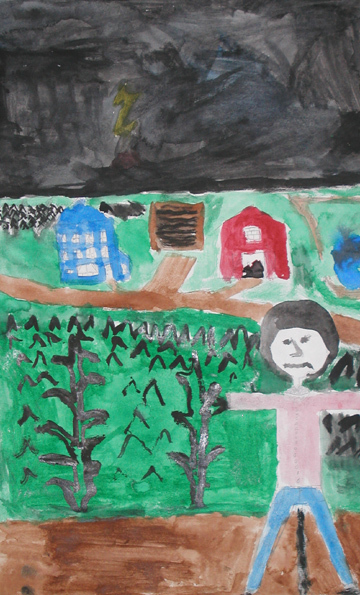 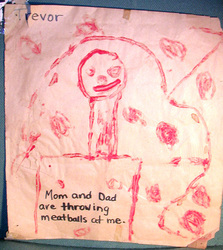 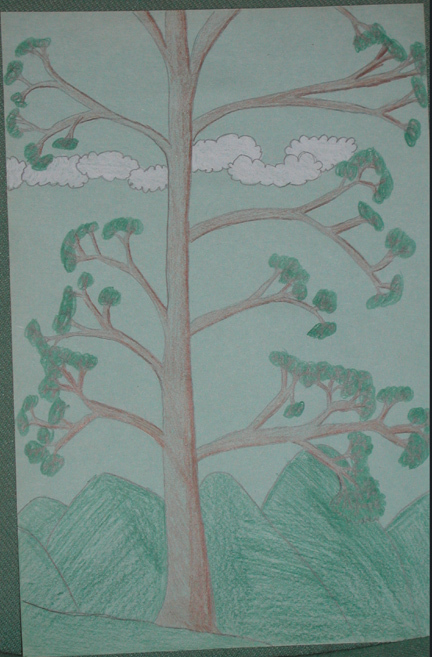 Solveig collected many of her son Trevor's art projects, from preschool to Grade 7, and in 2003 replicated each of these in fabric and embroidery. 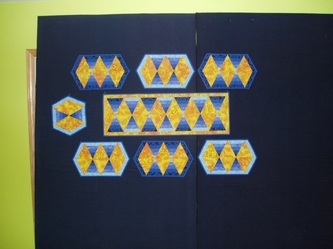 The top left image is the assembled quilt. 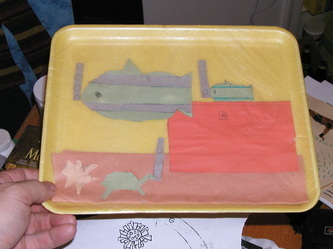 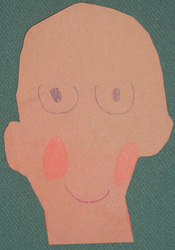 Most of the other images are photos of the actual art projects. Trevor treasures this quilt. 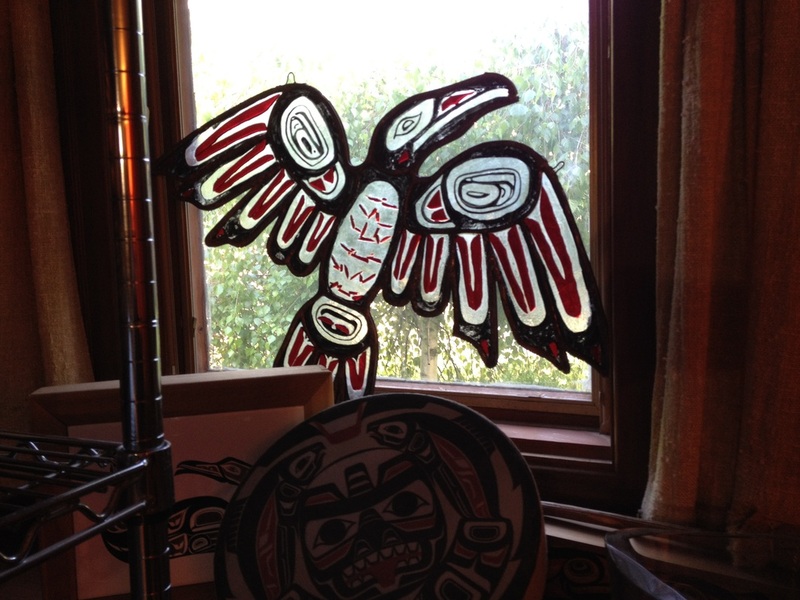 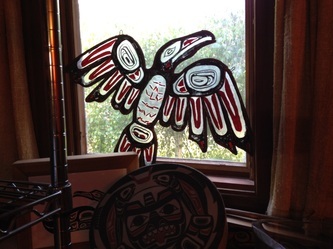 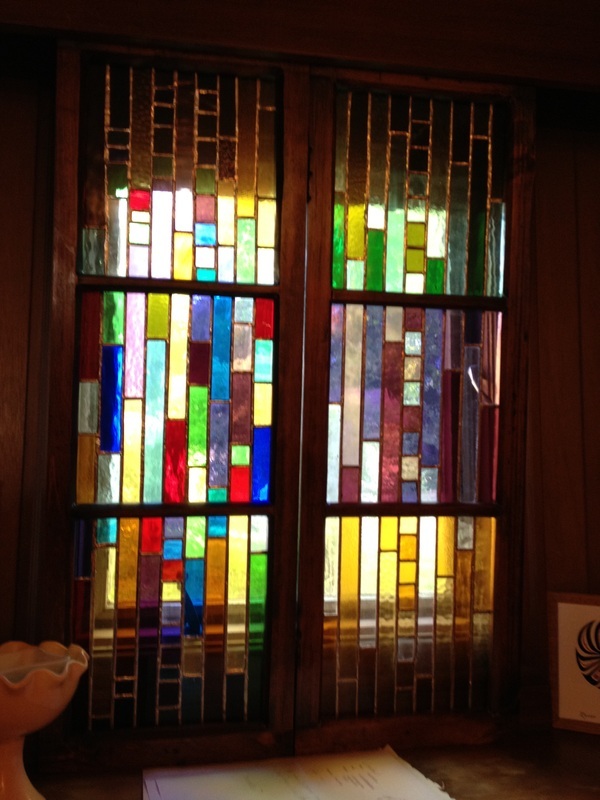 He is now an electrical contractor, and his artistic activity is now creating beautiful stained glass objects, such as the two examples on the bottom right. 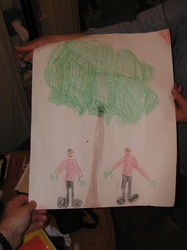 These were created in 2009. 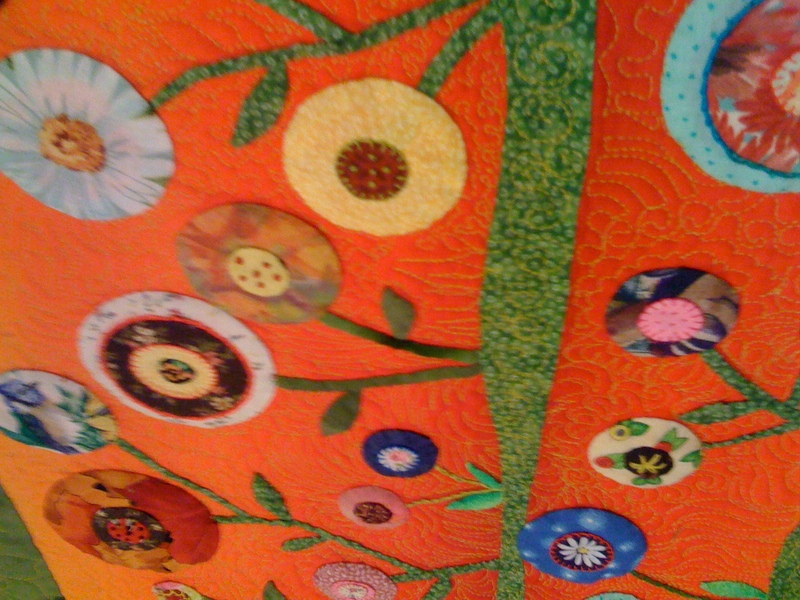 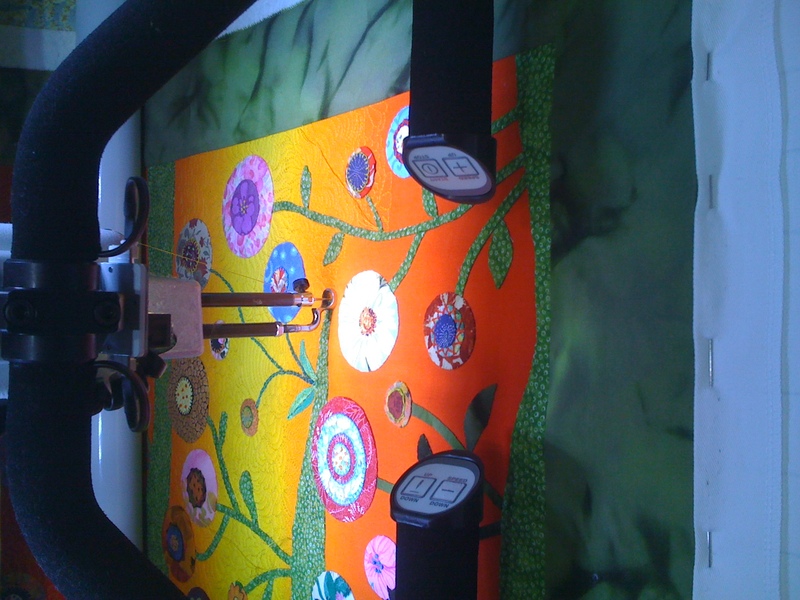 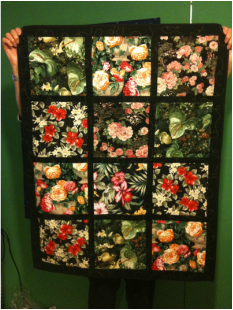 This quilt contains 109 flowers, each painstakingly constructed of three fabric pieces with embroidered highlights. 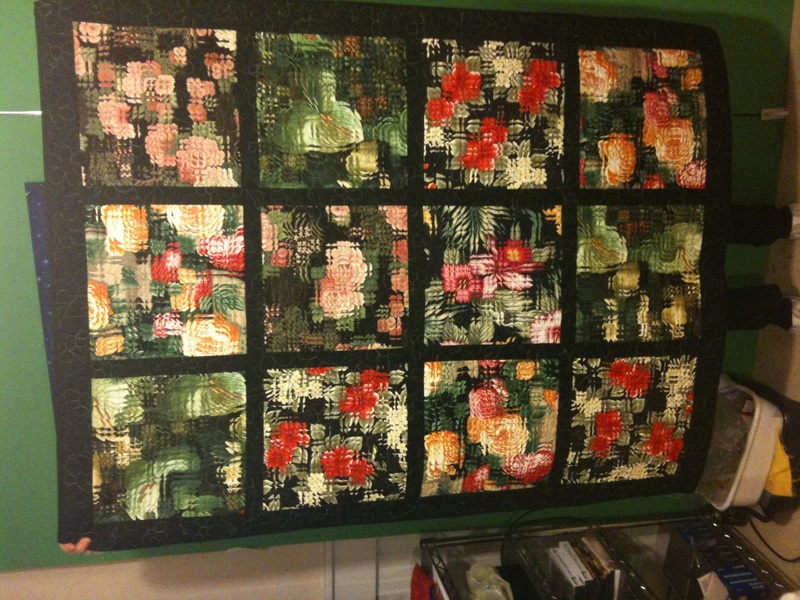 The background is a single spectacularly variegated fabric. 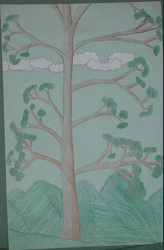 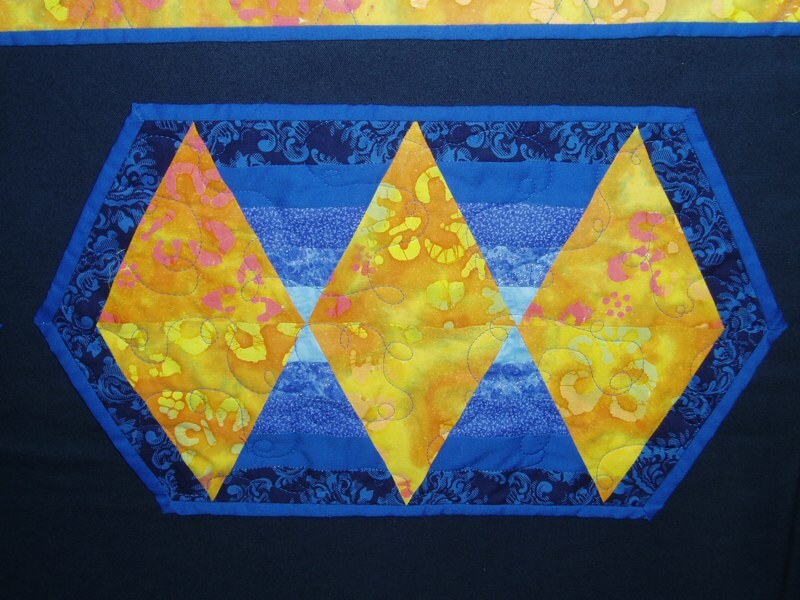 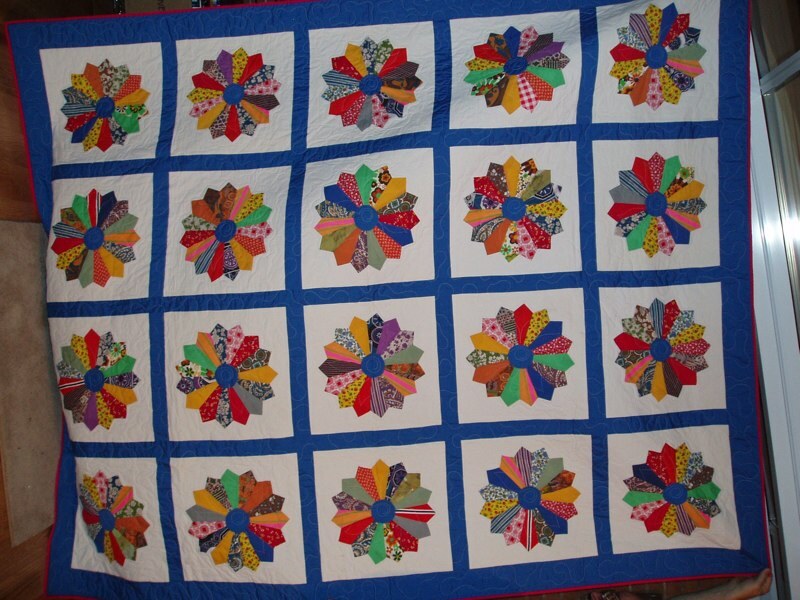 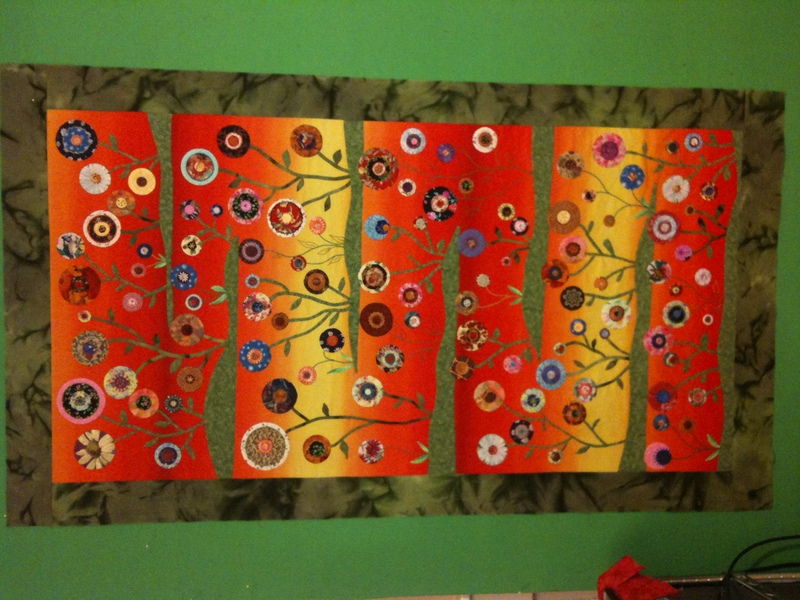 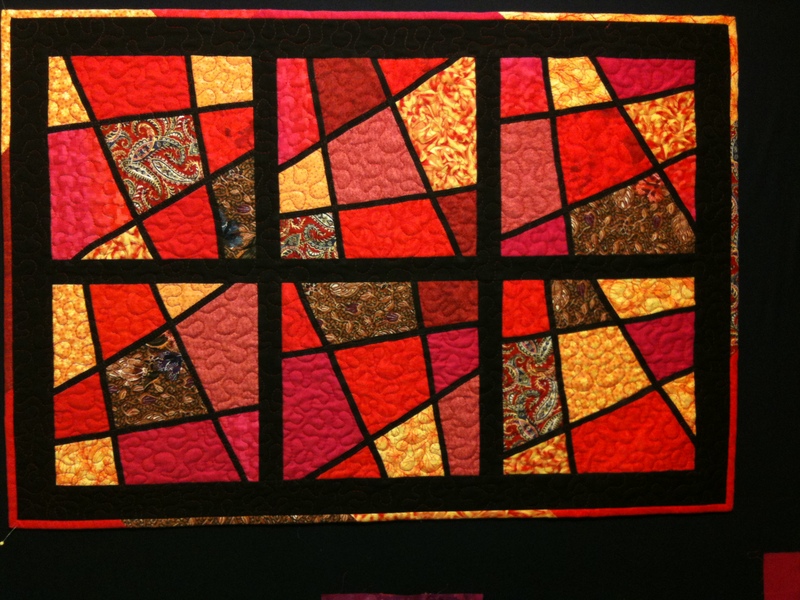 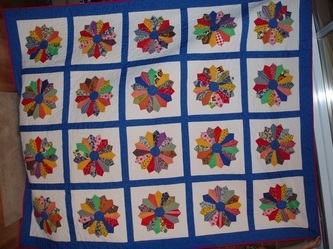 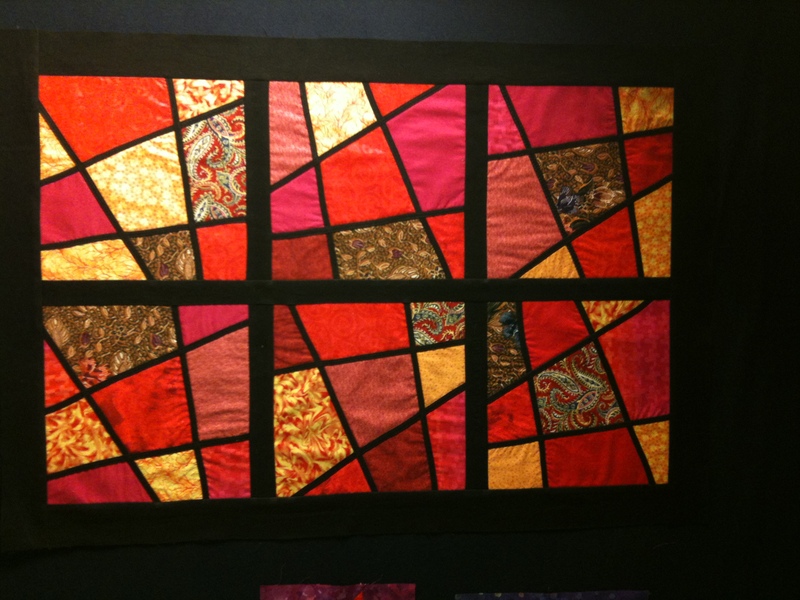 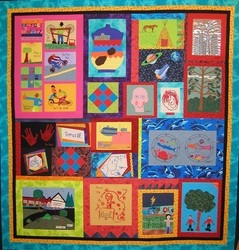 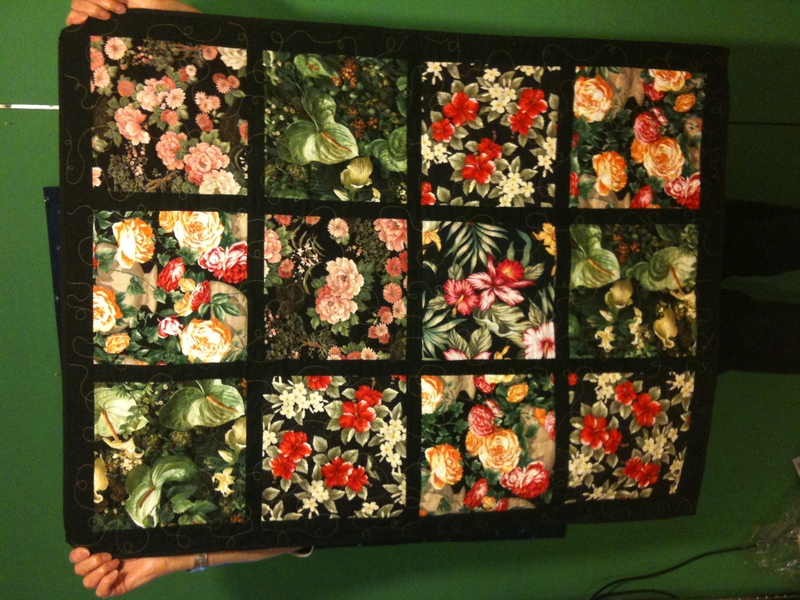 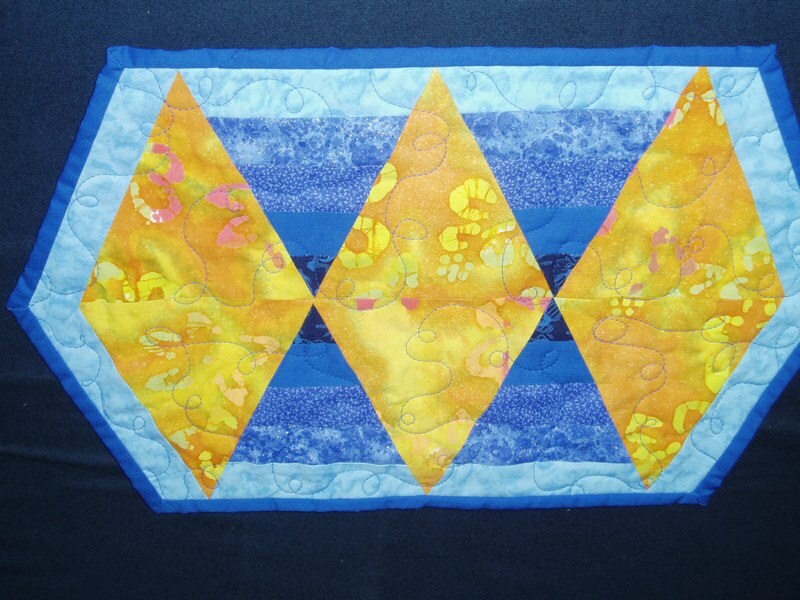 It was tightly quilted using Solveig's Handi-Quilter Fusion, in Bay St Louis in 2010. The quilt on the left shows the fabrics used before they were fractured. 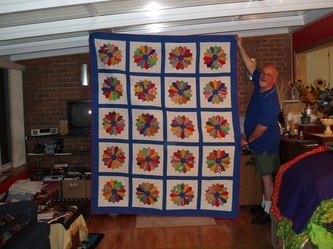 On the right is the fractured quilt.